The stars, oh the stars. Across the clearest and sweetest of night skies. of the wonder on display above their proud peaks. I have been under a far few starry skies in my time, from one end of this island to the other. I have gazed at the aurora dancing to the north from the Causeway Coast. I have seen the core of our galaxy rise in all its splendour in the wee small hours of the morning to the south at the Copper Coast. 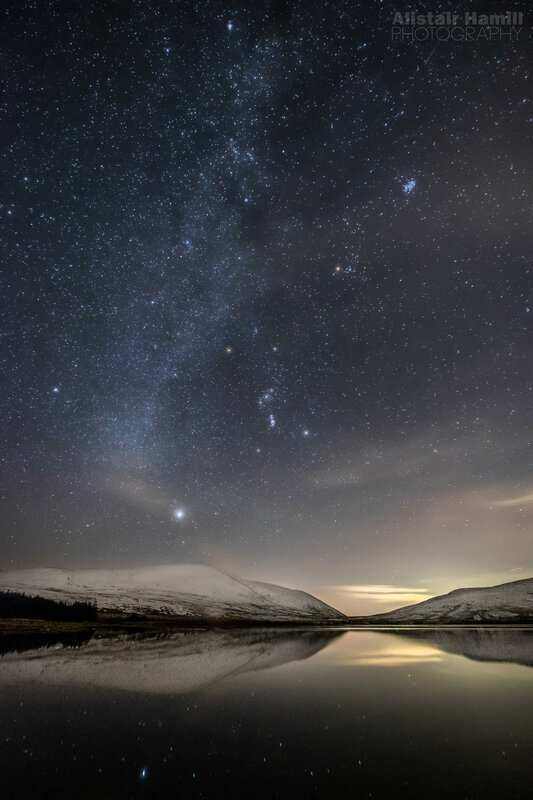 But rarely have I seen the sky so full of stars as I did last Saturday night at Spelga Dam. I had spent the day on top of Slieve Binnian, crunching up all those 700 m through the snow to enjoy a beautiful warm sunset above. As the afternoon went on, I noticed a temperature inversion building. Along the horizon, a thick haze built up. But above that, the sky was as clear as clear could be. I knew up there that the chances of a good clear sky were good later that evening when I planned to visit Spelga Dam after my hike. But, even that seasoned experience did little to prepare me for the sight that waited. Once I pulled the car in, and when my eyes adjusted to the dark, the night sky opened up to me like few I have ever seen before. The stars were so close you felt you could reach up and grab a rich handful of them. The lake below was so still, reflecting back many of the celestial points of light above. And, there, hanging to his left, was the Milky Way, draped as a cloak, running up from his shoulder and arcing across the sky above me. Normally, in Co Antrim with its light pollution to the south, I simply cannot even capture this on camera, never mind see it with my naked eye. But there, this time, it was plain to see. I have spent much of this winter photographing Orion. I have peered long and hard into the night sky in my pursuit of him. Never has he felt so close. Never have I become so lost in wonder and amazement at the wonders of the winter night sky above me. The stars. Oh, the stars.